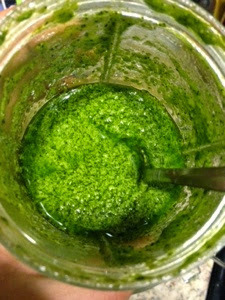 I made this super simple really yummy pesto that ended up tasting better and better the longer I let it sit in the fridge. Use within 2-3 days but it tastes better with age also it's less bitter after the flavors have time to meld together. I ate it with the dehydrated mushroom chips I had made and on top of rice noodles with some nutritional yeast. Super easy- blend all together and enjoy!